Small business ideas are generated on a daily basis, but marketing a new business idea is the biggest challenge to date. How do you start from zero and go to a hundred? With the evolving digital media platforms coupled with traditional mediums, the options can be endless, daunting, and expensive. As a small business owner with a new concept, your budget is more than likely tight. Give these quick tips a look and considering implementing them when marketing your new business. Web Presence: A web presence isn’t just having a website with your name and contact information. In today’s world, your web presence needs constant attention. Your website needs fresh content to stay relevant. You need to optimize for your audience and what they are searching for on the internet. Digital marketing solutions can provide everything from web design packages to full-scale social media management platforms. Paid and unpaid versions can help bootstrap your new business and generate followers, leads, and networking opportunities. You can create Facebook pages, Twitter accounts, Snapchat channels and more. Keep them professional and focus on your branding. You are trying to tell a story about your brand and why it is important to its viewers. Odds are you will need some graphic design work to draft channel art and a variety of other media. Search Engine Optimization: This ties in nicely with the web presence, as its a bit of a 1-2 punch. You have a website designed, your social channels in place with your graphics nicely packaged. But now you need your digital material to be presented to the appropriate audience. A while back we wrote a brief article on search engine optimization and the basic steps. But as a refresher, we will go over a few of the basics. The first step is funneling all of your material to your website, where you will hopefully have a successful landing page to convert your visitors into leads. However, your website will also serve as a lead generator by pulling in organic traffic from web searches. You will need to optimize your keywords, h1 tags, meta tags, alt tags, and every little bit of SEO you can optimize. You will do this by using Google’s keyword planner and having a carefully drafted keyword strategy. Marketing a new business doesn’t necessarily mean people haven’t already searched for that concept before. Chances are Google will have data on those search terms and keywords. Those keywords should be strategically placed on your website. Once your site is optimized, you will need to register the website with the search engines. To be indexed (i.e., found on Google/Bing) you will need to create a Google account and register your site with their webmaster tools. Submit your sitemap, and wait a few days while Google’s crawling spiders index your site for future visibility. Now, this is only considered on-page optimization. You will want to consider developing backlinks, which are external links pointing towards your new website. This is where your content creation comes into play. With fresh content being written, you will publish your blogs, stories, videos on your social channels. Reaching out to various influencers in your industry via some light networking will build your audience, and likely redistribute your content on their website or social channels. Professional Presence: Establish your brand as an expert in your field of business. It’s a bit of “fake it ’til you make it” aspect, especially if you are new, regardless of how much knowledge you contain. Seek out forums or queries that are related to your business. Start answering questions and pointing them to your website which will already answer those questions. Be a leader in the industry by instructing others. Twitter and website forums offer great opportunities to help others and give you the chance to push people towards your website. Remember, we are funneling traffic to your website, that is the main goal of marketing a new business. Word of Mouth: It took a bit of time for people to start realizing that I was in the digital marketing business, but once people knew, they started to come to me for solutions. My friends would often resort to me if they knew someone that need a website built. It worked far faster than any other medium and was the most cost-effective way of generating leads. Social Events: Ok, word of mouth only works if you have friends, or friends needing what you are offering. If all else fails to try enrolling in social gatherings, or alternative meetings where aggregated like-minded individuals gather. Ask them about how they marketed their new business, what works, what failed. Prepare to sell yourself, by do not overreach. And do not forget to load up on business cards! 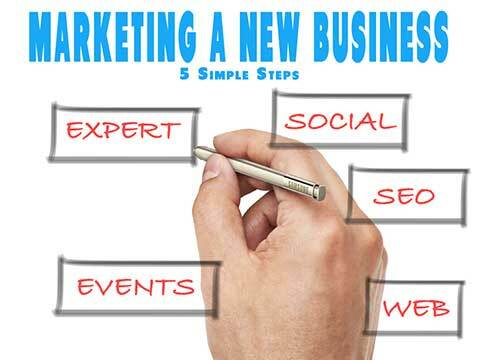 These are just a few ideal steps to marketing your new business. Looking for more effective marketing tips? Check out the links below.